The Hebrew verbs expressed here, ‘to praise and honor,’ indicate continued action. Nebuchadnezzar was changed – radically, but also permanently. The king was transformed. Before this, he had seen the God of Shadrach. 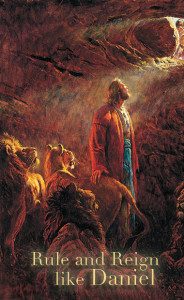 He had witnessed the God of Daniel and had been amazed. But he soon forgot. At last the king – now a common, simply human and needy man – met his own God. He comprehended His rule and also His majesty, worthy of entire praise. In this, the king was transformed. Everything is about knowing God who rules in heaven. The problem of Israel is stated by the Lord God over and over. “They do not know Me” (Isaiah 1:3). Nebuchadnezzar knows this Most High personally now, having met Him in the wilderness of shame and need…such is the place of divine revelation. The place where you can easily see you as God sees you, and see God as He really IS.